Lufthansa is not an award program most people think of when wanting to book an award flight. The inability to search for award flights without points in your account and the fact that Lufthansa only partners with one transferable point program put it at a disadvantage. However, there are definitely some options for you to maximize those points! Lufthansa miles (Miles & More) can be earned by signing up for its co-branded Barclays credit card. Lufthansa is a member of the Star Alliance, and the airline also partners with airlines who are not affiliated with an alliance. What does this mean? If you are looking to use miles on flights to different countries and continents, the Lufthansa program can be used to your advantage. Barclays offers a co-branded credit card, The Miles & More® World Elite Mastercard®, that will let your spending earn Lufthansa miles to redeem for award flights. You can earn Marriott Bonvoy points and transfer those to Lufthansa at a transfer rate of 3:1. Plus, for every 60,000 Marriott points that you transfer, you’ll receive an extra 5,000 Lufthansa miles bonus. With an understanding of the ways to earn Lufthansa miles, let’s jump into how to maximize the airline miles that you have earned. 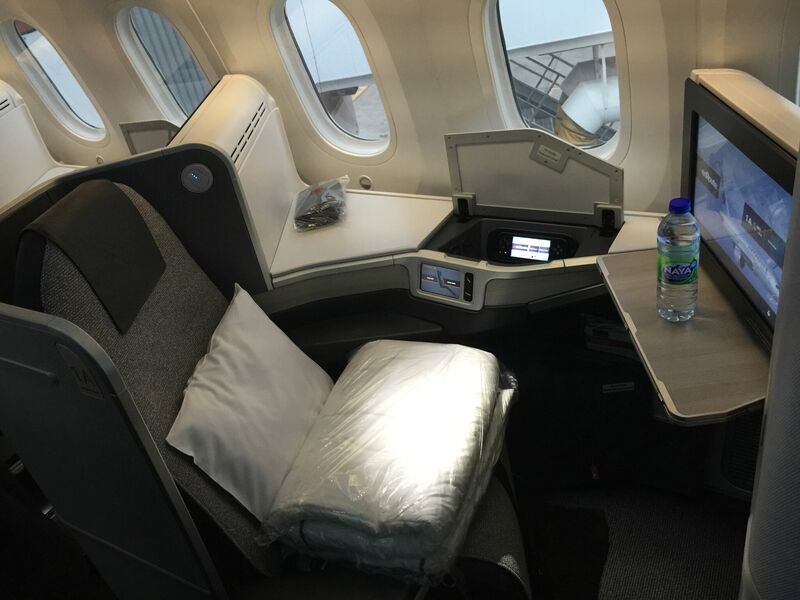 In this article, I’ll cover the best ways to redeem your miles for maximum value. 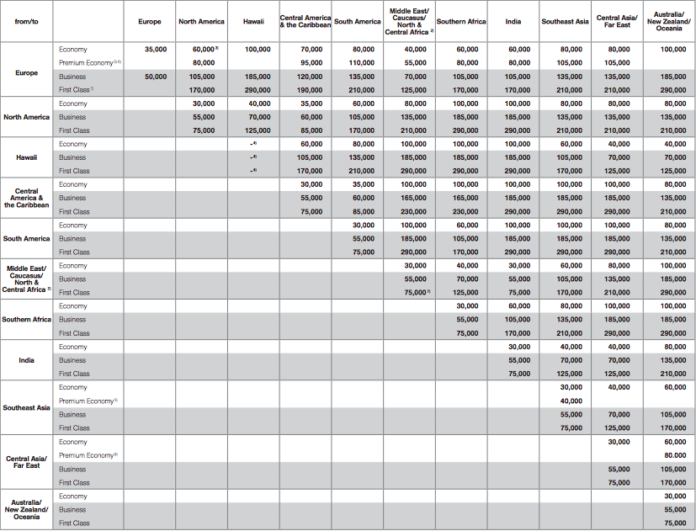 When calculating the miles required for your award flight, it’s important to note that Lufthansa uses both an award chart and a mileage calculator. 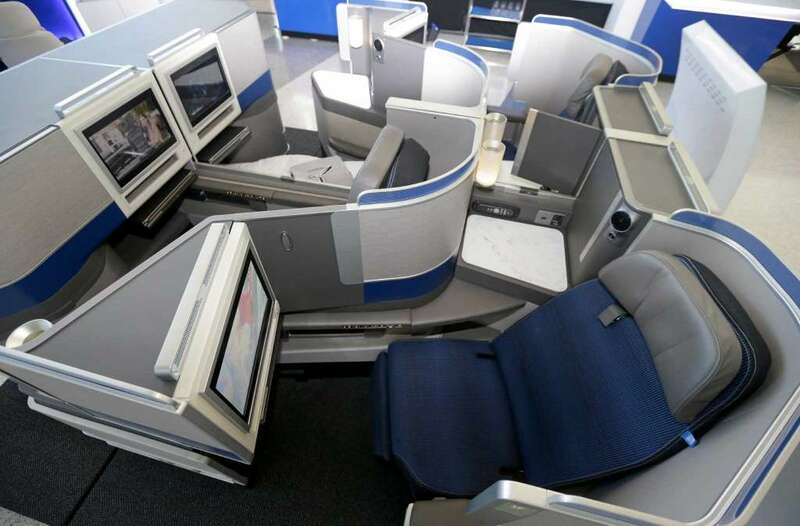 Fly United business class to South America! Image courtesy of HeathrowspotterUK. A number of award programs divide South America into 2 separate regions. What makes Lufthansa’s program great is that it groups the entire continent into 1 region. This means that you’ll receive even more value for long-haul flights to southern South America. Lufthansa considers Argentina, Bolivia, Brazil, Chile, Colombia, Ecuador, French Guiana, Paraguay, Peru, Uruguay, and Venezuela in its South America region. For North America, Lufthansa puts Canada, Greenland, and the U.S. (excluding Hawaii) into the same region. With 52,500 Lufthansa miles, you can book a one-way Star Alliance business class flight from North America to South America. You can also receive solid value for economy flights at 30,000 Lufthansa miles one-way. Hot Tip: United Airlines offers the most nonstop flights to South America from cities within the U.S.
Taxes and fees for a one-way business class flight will be around $28. If you are flying Air Canada, expect to pay significantly more in taxes and fees; we recommend calling Lufthansa to confirm the taxes and fees. Nonstop flights to the South Pacific are long, which is why many people opt for business class. 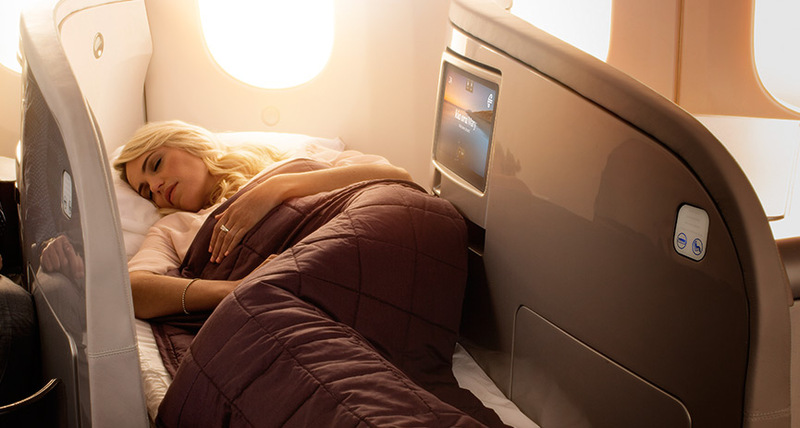 With Lufthansa, you can fly nonstop in business class for a reasonable number of miles. Lufthansa groups Australia, New Zealand, Fiji, and Tahiti (among others) into its Australia, New Zealand, Oceania region. With 67,500 Lufthansa miles, you can book a one-way Star Alliance business class flight from the U.S. to Australia or New Zealand. Economy can also be a good way to use your miles at 40,000 Lufthansa miles one-way. Hot Tip: Based on a recent search, you will want to search close-in (within 30 days of departure) for nonstop business class flights from the U.S. to Australia or New Zealand. Taxes and fees for a one-way business class flight will be around $50. We recommend calling Lufthansa to confirm the taxes and fees. Need help earning more miles? See our best ways to earn Lufthansa miles. Southeast Asia, like Australia or New Zealand, takes time to get to from the U.S. You will likely be on a 12-hour flight at some point, so many people focus on finding a comfortable way to fly that leg. Lufthansa groups Indonesia, the Philippines, Singapore, Thailand, and Vietnam (among others) in its Southeast Asia region. With 67,500 Lufthansa miles, you can book a one-way Star Alliance business class flight from North America to Southeast Asia. While economy is only 40,000 Lufthansa miles one-way, you will not receive a ton of value because the cash cost of these flights tends to be low. Hot Tip: Nonstop business class flights to this region are hard to find, so you will want to search close-in for an award flight. Taxes and fees for a one-way business class flight should be around $28, though we recommend calling Lufthansa to confirm the taxes and fees. Need help booking an award ticket? See our step-by-step guide for booking Singapore Airlines business class. 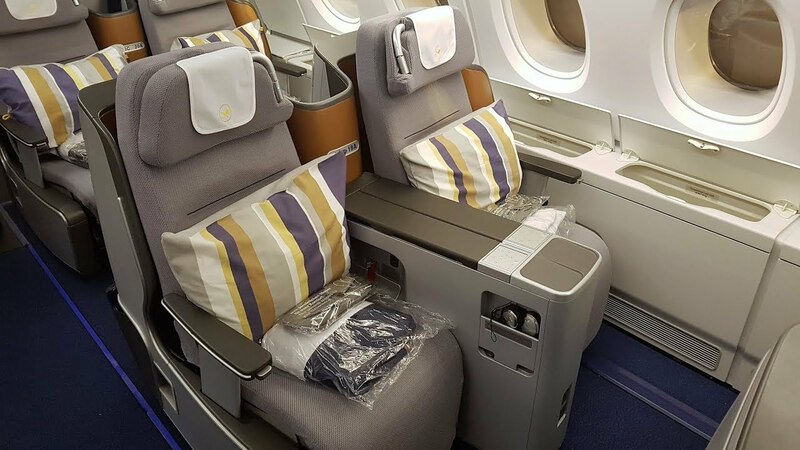 While booking a domestic U.S. or Canaday business class flight may not be as exciting as Southeast Asia or Australia, you can find value for these flights with Lufthansa miles. With 17,500 Lufthansa miles, you can book a one-way Star Alliance business class flight within North America. 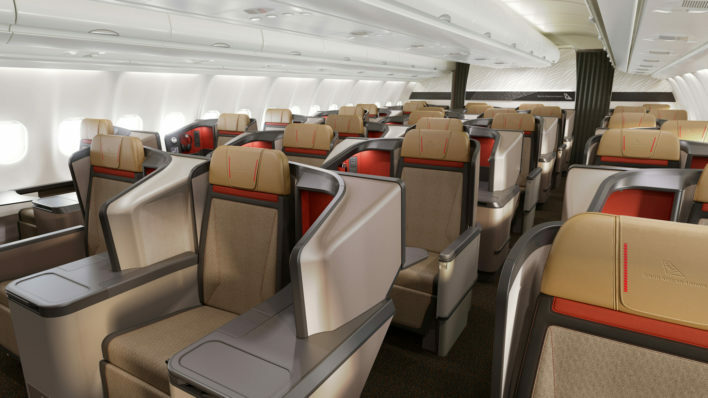 Taxes and fees for a one-way business class flight will be around $43, and you can expect to pay more taxes and fees when flying Air Canada. We recommend calling Lufthansa to confirm the taxes and fees. Travel within North America, such as US to Canada, is 27,5000 miles one-way (increases to 30,000 on May 9, 2019). Have Air Canada Aeroplan Miles? See our best ways to use Aeroplan miles. 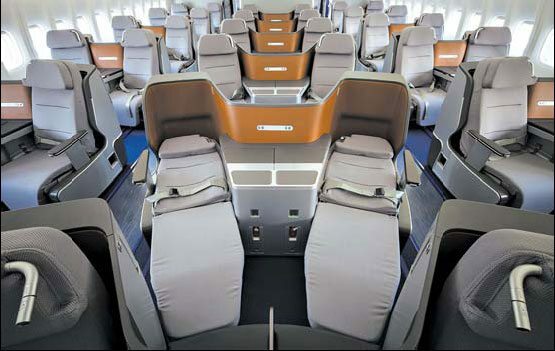 Another long-haul flight when you’ll likely want to fly in a premium cabin: the U.S. to Asia. Lufthansa groups China, Hong Kong, Macau, Taiwan, Japan, and South Korea in its Central Asia/Far East region, while other award programs typically do not include all of these countries in the same region. With 67,500 Lufthansa miles, you can book a one-way business class Star Alliance flight from the U.S. to Asia. While economy is only 40,000 Lufthansa miles one-way, you will not receive a ton of value because the cash cost of these flights tends to be low. 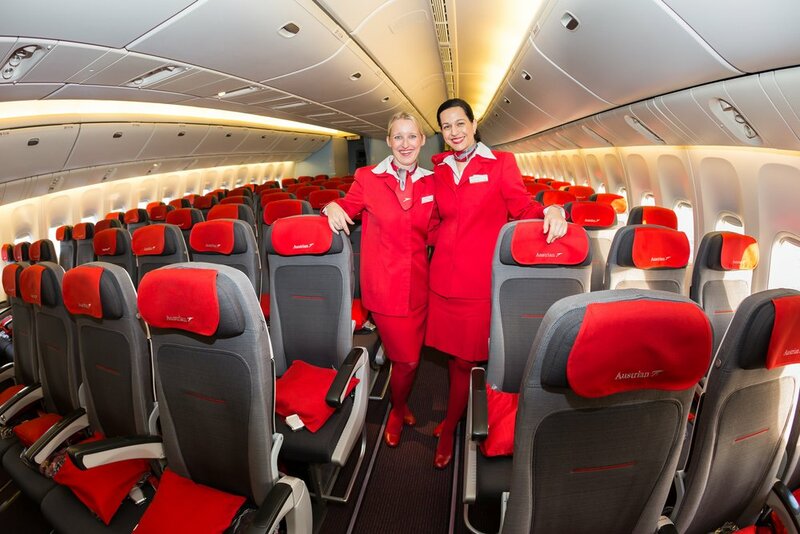 Hot Tip: You will want to search close-in for award space in a premium cabin. Based on a recent search, I did not find availability 10-11 months out in the calendar. Taxes and fees for a one-way business class flight will be between $28-$242, depending on the airline. We recommend calling Lufthansa to confirm the taxes and fees. Need help booking an award ticket? See our step-by-step guide for booking EVA Air business class. Fly South African Airways to South Africa! Image courtesy of AusBT. Nonstop flights from the U.S. to Africa can be tough to find, but you’re in luck: Star Alliance South African Airways will cover you. Lufthansa divides Africa into 2 regions, with the Southern Africa region including Mauritius, the Seychelles, and South Africa, among others. With 92,500 Lufthansa miles, you can book a one-way business class flight from the U.S. to southern Africa. 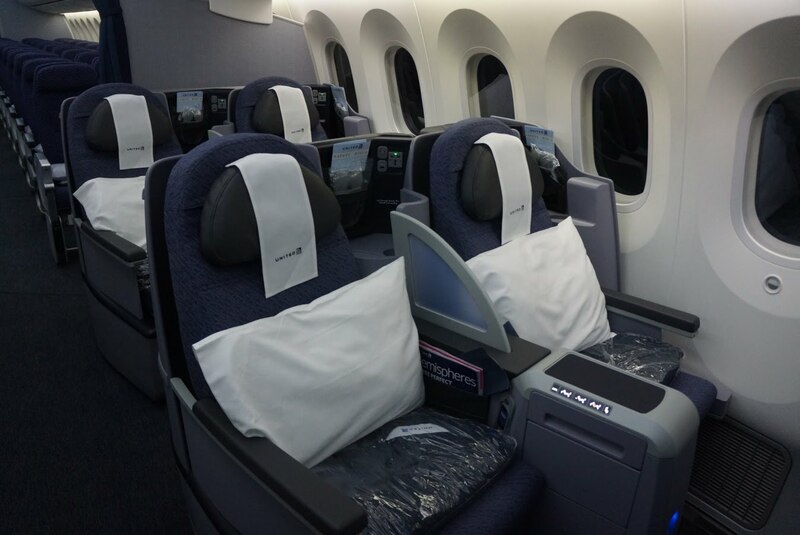 Economy can also be a decent way to use your miles at 50,000 Lufthansa miles one-way. Hot Tip: Nonstop business class flights from the U.S. to Africa are hard to find, so you will want to search 10-11 months out in the award calendar for availability. Taxes and fees for a one-way business class flight will be around $285, but we still recommend calling Lufthansa to confirm the taxes and fees. Want to know more about the Star Alliance? See our Everything You Need to Know guide. 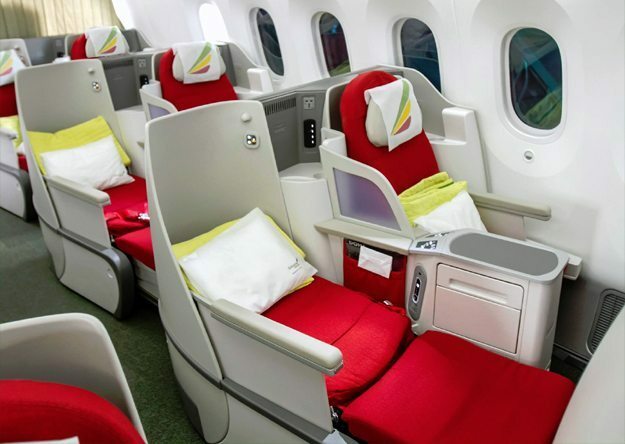 Fly Ethiopian Airlines to Africa! Image courtesy of TheLuxuryTravelExpert.com. With the way Lufthansa divides Africa and the Middle East regions, the Middle East region is served by 2 Star Alliance airlines. Lufthansa groups Egypt, Ethiopia, and Morocco (among others) in its Middle East region. With 67,500 Lufthansa miles, you can book a one-way Star Alliance business class flight from the U.S. to the Middle East. Economy is only 40,000 Lufthansa miles one-way, but you will not receive much value because the cash cost of these flights tends to be low. Hot Tip: Award availability in business class is hard to find. Based on a recent search, you will want to look 10-11 months out into the award calendar. Taxes and fees for a one-way business class flight will be between $224-$241. We recommend calling Lufthansa to confirm the taxes and fees. 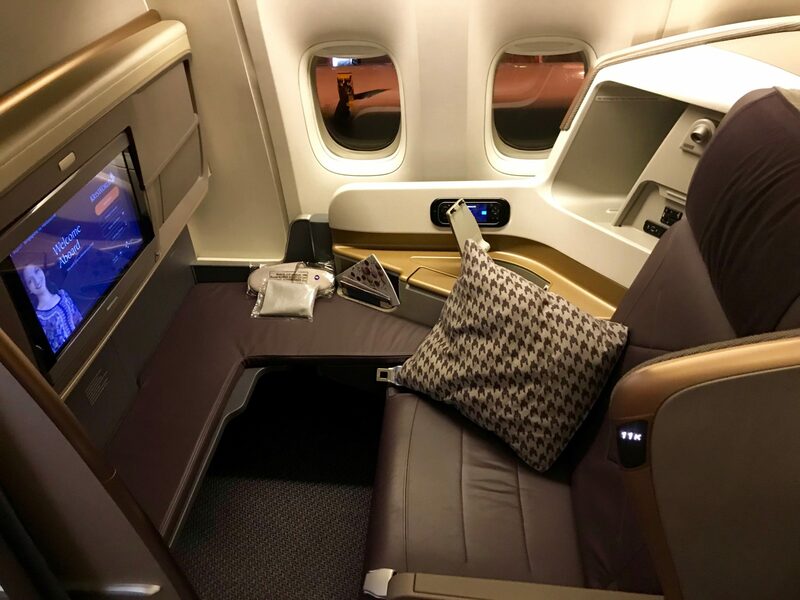 Bottom Line: With 2 Star Alliance airlines covering this region, you will have a much better chance of finding award availability in a premium cabin. The India region includes at least one country that’s currently on my radar to visit in the near future. Lufthansa includes India, the Maldives, and Sri Lanka in its India region. With 92,500 Lufthansa miles, you can book a one-way Star Alliance business class flight from the U.S. to the India region. Taxes and fees for a one-way business class flight will be around $28, and will be significantly higher when flying Air India. We recommend calling Lufthansa to confirm the taxes and fees. With so many of its member airlines based in Europe, the Star Alliance provides a number of nonstop flights from the U.S. to Europe. With 52,500 Lufthansa miles, you can book a one-way Star Alliance business class flight from the U.S. to Europe. Taxes and fees for a one-way business class flight will be around $28 on United. The taxes and fees will vary by airline, with Lufthansa having higher taxes and fees — though it’s best to call and confirm the taxes and fees before you book. Need help booking an award ticket? See our step-by-step guide for booking Lufthansa business class. The Lufthansa Terms & Conditions outline most of the redemption rules including stopovers, open jaws, and “Round the World” award flights. It’s important to read through the rules or contact the Miles & More team with questions related to your specific redemption. Miles & More is the frequent flyer program of Lufthansa and airlines like Austrian Airlines, Brussels Airlines, Swiss Air Lines, and LOT Polish. Lufthansa is a member of the Star Alliance (along with United Airlines), and it has individual partnerships with airlines outside of the Star Alliance. The Miles & More program uses a region-based award chart that is driven by the destination/origin and the class of cabin you are flying in. As noted in the award chart, you can combine Star Alliance flights with Lufthansa flights, as well as with other airline partners on a single award. The award chart also has separate pricing for domestic flights (within and outside of Europe), flights using 3 regions, and “Round the World” itineraries. Lufthansa’s Terms & Conditions state that you can book award flights on the Lufthansa or Miles & More website for all flights operated by: Adria Airways, Aegean Airlines, Air Canada, Air China, Air Dolomiti, Air Malta, Air New Zealand, All Nippon Airways, Asiana Airlines, Austrian Airlines, Avianca, Brussels Airlines, Cathay Pacific, Condor, Croatia Airlines, EgyptAir, Ethiopian Airlines, Eurowings, EVA Air, LOT Polish Airlines (except Premium Economy Class), Lufthansa, Luxair, Scandinavian Airlines, Shenzhen Airlines, Singapore Airlines, South African Airways, SWISS, TAP Portugal, Thai Airways, Turkish Airlines and United Airlines. If you are looking to book an airline not listed, contact the local Miles & More Team in California. When searching for award space, I recommend using the United Airlines website to search for availability. Other options to search for Star Alliance award flights include Aeroplan and ANA. “Round the World” flights must cross the Atlantic and the Pacific once, and there must be at least 10 days between the start of the first and completion of the last long-haul flight. For a flight award for children aged between 2 and 12 years, 75% of the miles for an award flight with a return flight are required. Infants who do not occupy a seat only pay the taxes, fees, and surcharges. If you need to rebook or cancel an award ticket, you will need to pay $58 per person. You can only change the date and time of the flight when you rebook. It is not possible to change the route. Fly Smart awards are discounted flights that can only be booked online. Mileage bargains are similar to Fly Smart awards, but are temporary discounted offers. The Miles & More program is an under-the-radar program that provides value on select routes. 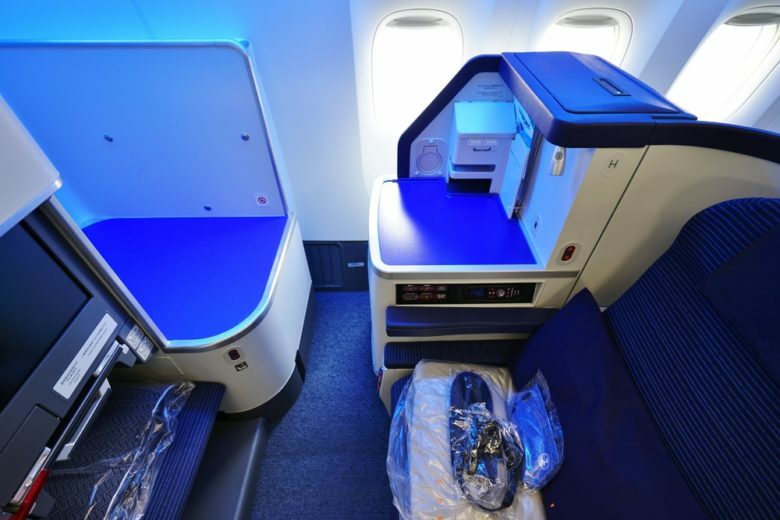 As with many award programs, the best way to use your miles is on long-haul flights in a premium cabin. Now it’s time to use your Lufthansa miles for an award flight! How can I earn miles on Lufthansa? You can earn miles for flights on Lufthansa and its partner airlines by booking with its hotel and car rental partners, spending on Lufthansa’s co-branded credit card, or using other credit cards that transfer to Lufthansa. Is it possible to earn Lufthansa Miles & More by using credit cards? Lufthansa’s co-branded Barclays credit card earns miles directly with Miles & More. What are Miles & More worth? You should be able to find redemption values above 5 cents per mile, particularly for premium cabins. When you are looking at economy redemptions, recent searches confirm you can still receive more than 2 cents per mile in value. Are Miles & More refundable? Yes, but you will need to pay $58 to rebook or cancel the award flight that you booked. When do Miles & More expire? Miles will expire after 36 months of no activity in your Lufthansa account. Is Lufthansa part of United Airlines? Lufthansa is not part of United Airlines, but both airlines are part of the Star Alliance. The alliance means you can redeem your Lufthansa miles for flights on United and your United Airlines miles for flights on Lufthansa. While you can use miles from one airline to fly another airline, it’s not possible to combine miles between the 2 programs. 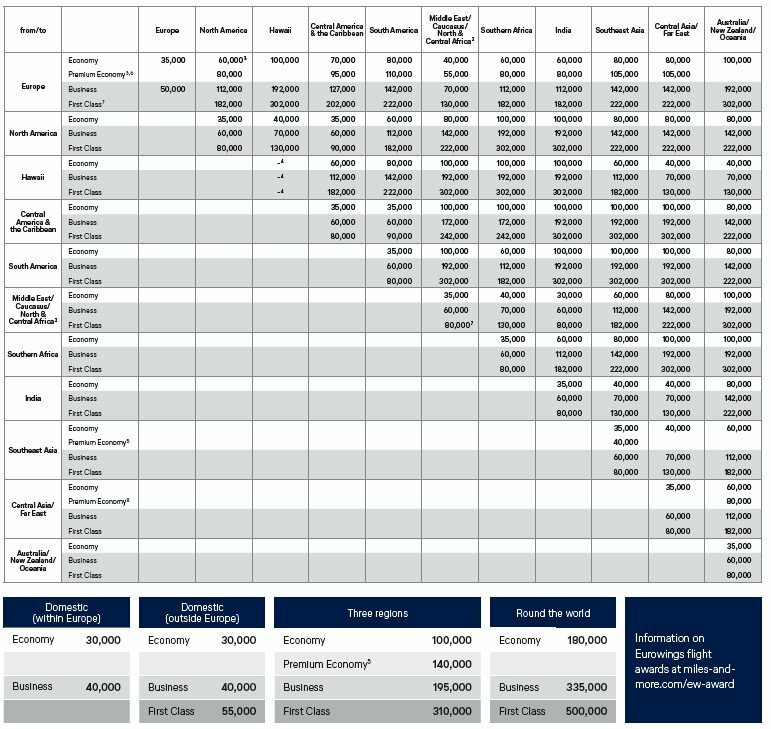 How much does it cost to buy Miles & More miles? Lufthansa does not currently offer the option to buy airline miles.